Today Nowell and I went to the Embarcadero waterfront area downtown here in San Francisco. 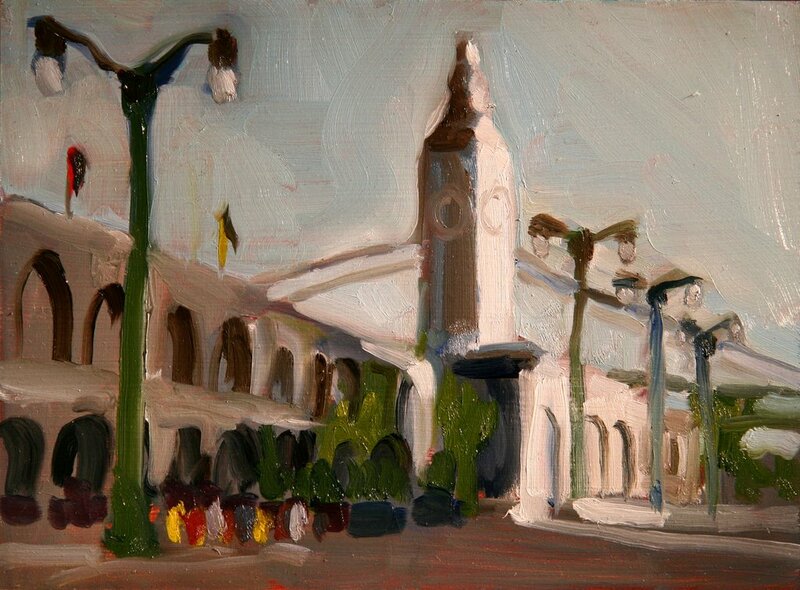 Nowell experimented with his new HD video camera while I did this painting of the Ferry Building. It was very cold and as the sun sank lower the wind picked up, so by the time we packed up our equipment we were shrieking with the cold and forcing our numb fingers to work faster. We dropped everything off in the car (where I balanced the wet painting on the dashboard) and managed to recover from the cold at the bar of the nearby Slanted Door restaurant with a snack of sherry and oysters. Overall, a pretty satisfying day.